The £75m Highways England scheme in North Tyneside, which will lower the A19 under the A1058 Coast Road and Coast Road roundabout, is now 70% complete with less than a year left on site. Since work started in June 2016, three new bridges have been constructed - one to support the A1058 Coast Road over the Coast Road roundabout and two to carry the Coast Road roundabout over the newly lowered A19. To support the new structures more than 580 piles have been installed, which end-to-end will cover seven miles, and two miles of new drainage. Now around 80,000 cubic metres of soil is being removed and being used to help form the embankments on the nearby A19 Testos scheme. Highways England assistant project manager Steven Cox said: ‘We are nearly three quarters complete now, with the main bulk of the work digging out the 80,000 cubic meters of soil as the last major milestone. ‘Drivers who use this junction regularly will already be able to see progress as the earth is removed to create the third layer of the junction which will mean drivers will be able to continue straight along the A19 underneath the roundabout. Over the remaining 10 months, improvements will be carried out to the 1,175 metres of cycleway and an extra 247 metres will be created. Gantries for improved signage will be installed and the roundabout completely resurfaced. The scheme is being delivered by a Sisk Lagan joint venture. It is supporting the Year of the Engineering campaign, which aims to inspire young people to consider engineering as a rewarding career. The A19 Coast Road scheme employs six graduates or apprentices and 60% of its workforce is from the North East. 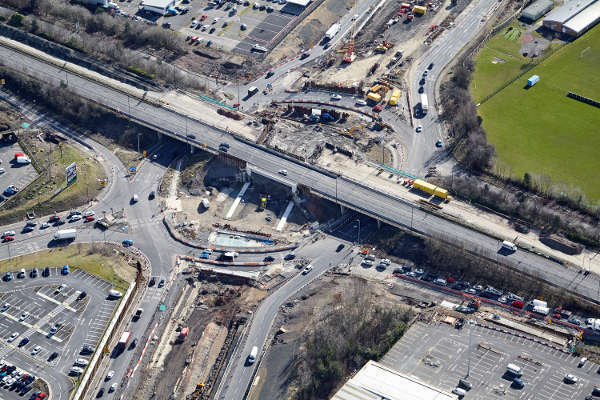 Highways England previously published a flythrough video of how the junction will look once the scheme has been completed.